Student-centered and Inquiry-based: with the student doing the work of learning. Yoga presents a natural opportunity for this, engaging students’ natural curiosity as the most effective way to motivate. Objective / Theme Driven: Meaningful learning requires meaningful delivery. Each class should be centered around 1 main inquiry with yoga activities to support that inquiry. Fun: Activities that require listening, focus, thoughtful attention to self/other, should be interspersed with games, movement and fun. Y12SR combines the wisdom of yoga with the practical tools of the 12 step program. Each class begins with a an opportunity to check in and share challenges and successes in a non-judgemental meeting of peers, followed by a yoga class to get at the issues in our tissues. We offer classes for low income adults and seniors. Our classes for CT seniors are delivered in housing developments and at senior centers, using the evidence-based Silver Age Yoga program. All senior classes are chair based, with instructors modifying to accommodate those that seek / develop a need for greater physical challenge. 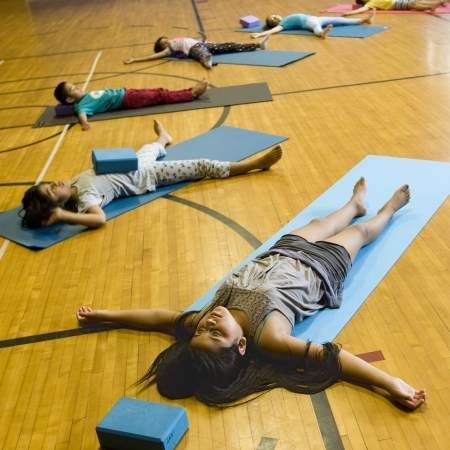 Utilizing the evidence-based Kripalu Yoga in the Schools Curriculum, we provide youth-oriented classes for kids age 3 - 18 in the community and in schools across CT.